I’m in search of a planner. I’ve eagerly clicked on links in Facebook and Pinterest to see if maybe *this* planner is my missing piece. I’ll share my final choice in another post, but wanted to highlight these all in once place in case someone else is looking for one as well. First, I went through my three Facebook groups and searched for “planner”. The results showed people sharing their planners, sharing blog posts about planners, and people commenting on said blog posts and FB posts about their planners. I jotted down the planner mentioned and then asked 5 questions about each planner to compare them. whether it has dates pre-printed, or if it’s undated so you add your own dates to the pages. These are all things that are important for me, so I wanted to know where each planner recommendation fell. I’m assuming here that I’m not the only one this matters to, so listing them all here for your personal review as well! NOTE: None of these are affiliate links and I have not personally used any of these planners. Though I’d really like to someday! My Thoughts: While specifically for planning out and tracking blogs, this would work well for just agenda planning as you can print just the pages you need. My Thoughts: I love the simplicity and price, but almost too “trendy” with the quotes and stickers. My Thoughts: The digital and physical products seem slightly different in layouts. Designed for photographers, but could work for others too. Lots of marketing/business building info and checklists included. My Thoughts: I love the concepts and the weekly review. Time blocking doesn’t work for me though. My Thoughts: Love this concept and is similar to what I’m doing now, though a bit more formal. You can use your own notebook or buy theirs to get you started. My Thoughts: I’ve heard great things, and might be worth it for the goals and such, but time blocking doesn’t work for me. My Thoughts: This is almost too introspective for my analytical mind. Some great sections for achieving clarity and direction. My Thoughts: While this does have two columns, one for time and one for task, not the ideal layout for me. They do have a lot of free printables to give it a try, so that’s cool. My Thoughts: Some neat and unique goal setting sections, great option for UK/Europe folks, maybe not US as much. My Thoughts: Awesome for strategy, plan to really use next year when I have some numbers to compare. Will review for this year to get off on the right foot. My Thoughts: I’m very tempted on this one as love the vertical layout. Price seems steep, esp. since my track record with USING a planner isn’t great. My Thoughts: Love the download feature, really like the planning sheets. Week is Sun – Sat, which I’d rather Mon – Sun, but that’s me. My Thoughts: A simple concept, great layout. A bit pricey however. My Thoughts: If you’re in to the whole law of attraction, this would be a great planner for you. Personally, it’s a bit much for me. My Thoughts: Not much info online, but some great bonuses with the package. Time blocking doesn’t work for me though. My Thoughts: This would work great for just a simple task tracker. It’s pretty inexpensive, so could be used for specific projects. My Thoughts: Price is right, would be great for student. Again, time blocking isn’t for me, but it is a simple agenda with room for notes and reflections. My Thoughts: Pretty basic, though the covered spiral is unique to this list anyway. Think I’d go with the Moleskine instead if I wanted basic. My Thoughts: Two versions, weekly and daily, both very different in layouts. For the price, I’d go with other options personally. My Thoughts: I think this is the first one I liked, but was unsure it would work for me. Reviewing again, I liked it more! May try a couple others, but expect I’ll come back to this one. Price is on the high side though, and not sure about the hard binding. They say it lays flat, but I’d like to find more reviews. My Thoughts: Looks like a fun, quirky option. Some good planning sections and lots of space for tasks. However, I really have to weigh the cost investment against what I expect to get out of the planner. If I truly used it and lived out of it, then I can easily justify the cost. But I know myself and how I tend to start something “cool” and then fizzle out. May try a less expensive option first and see how 2017 goes. If you have used any of the above planners, please leave a comment and tell me what you thought and share some pros and cons about the planner. The more info we have, the better our choice becomes! 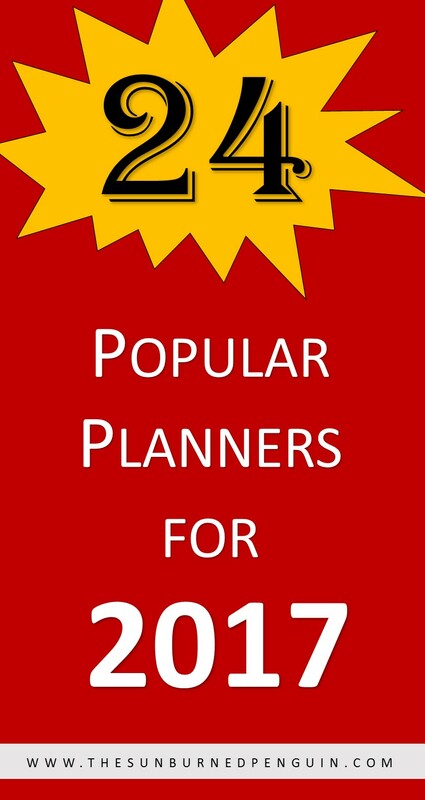 Thanks for including the WriteMind Planner in your roundup! It was very fun to discover it here! Great list! There is also a new spiral bound planner (Recollections) at Michael’s. It is quite similar (ok, eerily similar)to the Erin Condren Life Planner. It’s $30 but they go on sale quite often for 50% off. I like the vertical layout so I can use the 3 sections for everyday, work, blog. Thanks for sharing! I do love the vertical layout of the EC planner, so will have to check out the one at Michael’s. I don’t have one in my area, but my mom does. Thanks! One of my goals for my blog this year is to plan ahead and be more organized and this is exactly what I needed! Thanks so much for sharing! I’m so glad it was helpful Christina! What a great list! Around here I use the Passion Planner and the Freedom Journal. I like simple calendars with big areas for writing in info, but I’m now starting to spice things up with creative stickers and drawings. Thanks for the work you put into this info! Thanks Renee! I’m glad you liked the list. There’s a lot of awesome planner options out there; I’m glad you’ve found what works best for you. I’ll have to take a look at the Freedom Journal. I keep hoping to find the “perfect” option for me. I’m concerned that if I use more than one planner, I’ll end up not taking advantage of all the features ’cause I’ll be overwhelmed! How have you balanced using multiples? Thanks! I struggle every year with what planner to use. Since I work online, so I always think, do I really need a paper planner or just use Google? LOL Although, I love having the paper planner. I hear you Abigail! My day job is working remotely, so 100% online. But I’ve really found that paper helps bring me back on track so I don’t get distracted by all the various websites and such that I use on a daily basis. Thanks for your comment! I know, isn’t it? Might end up trying that one, or something similar!